The Holden Flynn Foundation, Inc.
(1) We welcome all submissions! Any designs submitted will be presented anonymously to the the (Proposed) Board of Directors for voting. (2) We are looking for a simple design. Someone that can easily become recognizable. (3) Please remember we are limited by some copyright, designs shouldn't use anything that is the property of another. (5) Submissions are needed NO LATER than April 20th. We are forever thankful to everyone who has donated to the Holden Flynn Fund, and as the paperwork is currently pushing through the ringer, we wanted to highlight a certain group of kids. St. Andrew is a Catholic School here in Orlando that has hosted 3 generations of Trey's family. The first grade class, behind the effort of our cousin Capresse spent all of February selling fruit snacks to the remainder of the school. She made an announcement on Facebook Friday night. Well, the St. Andrew First Grade classes did it! 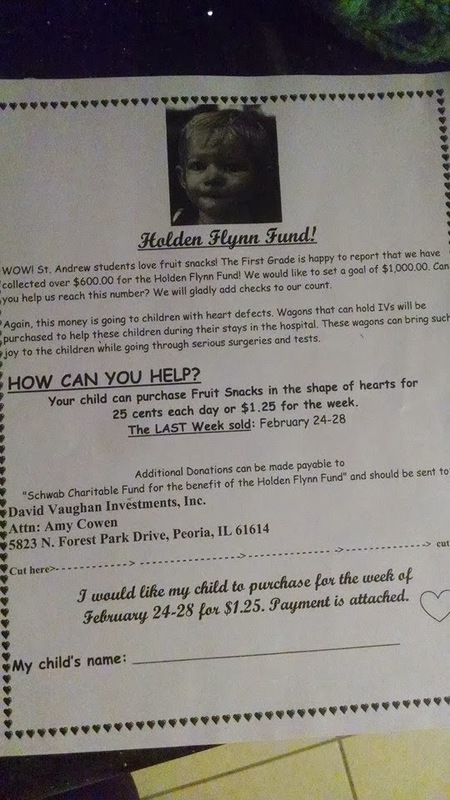 We raised $1,000.00 for the Holden Flynn Fund! The First Graders will continue to share their hearts in the hopes to fix so many little hearts.